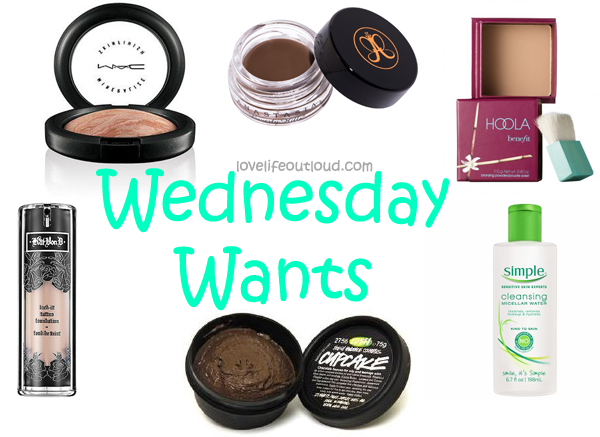 It's that time again for another Wednesday Wants! I promise it's not too much this time and I definitely plan on picking all these up as soon as I work through my existing makeup stash. I'm interested to some old holy grail products of people and I finally heard enough about them to want to try them myself. I'm proud to say I haven't had a haul for awhile and besides just buying essentials I've been busy enough to keep myself out of the trouble and my credit card in check. Simple Micellar Cleansing Water. After my BioDerma fail, I'm really interested in trying this cleansing water. Honestly I still don't really get it, is it suppose to be like a toner or a makeup remover? Someone please explain this to me, but either way I want to get my hands on a bottle of this stuff ASAP! MAC Mineralize Skinfinish in Soft & Gentle. I think I really want all the skinfinishes to be honest but lets start with just one at a time. This one is actually the one that MAC associate suggested to me when I picked up Lightscapades, so now I want it next! It's definitely a glowy highlighter so this would compliment my skin tone very well. LUSH Fresh Cupcake Mask. Without fail, everytime I go into a LUSH store to buy this guy it is always sold out! I think I'm coming on the wrong day since I know these things are made fresh weekly so I think I just need to switch up the day that I go. This smells of delicious chocolate cupcake and is targeted towards oily skin, basically my ideal face mask. My only fear is not using it up before it goes bad but my love of face masks is borderline obsessive so I don't think I'll have that problem. Anastasia DipBrow Pomade. I've been going back and forth about whether I wanted this, but I think my brow game is strong enough that I can handle the pomade. I've successfully mastered brown liners of all shapes and sizes, as well as various powders so a little pomade doesn't bother me! The brow wiz was the closest color match for me so I'm sad that it pulled out my sparse brow hairs so I'm interested to try out the pomade this time around. Benefit Hoola Bronzer. Everyone talks about, and finally I want it. Contouring is my crack now so I'm dying to try out the bronzer that just about everyone starts with but for some reason I missed out. Kat Von D Lock-It Tattoo Foundation. It's weird that a foundation made the list for me but I hear that this is a truly budge proof foundation for oily skin people. Mostly just out of curiosity I want to try this. I should probably save myself some money and just ask for a sample but hey, if I can clean out my foundation drawer I may just treat myself! What are some things you're currently coveting?